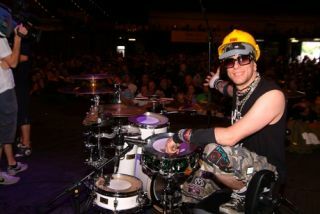 UK drumming workaholic Robin Guy has just checked in with Rhythm to give us the lowdown on his latest gig. The session ace, who's CV includes stints with the likes of Rachel Stamp, Faith No More and Bruce Dickinson, has linked up with Welsh glamsters Tigertailz. Robin explained: "I started getting some calls and mails from the Tigertailz camp a couple of weeks ago, as they were drummer-less and had some shows coming up. Apparently, my name had been cropping up here and there on forums and suggestions for a suitable slammer, as it's a fairly OTT show. "I've just got back from Wales after a quick try-out rehearsal - everything seemed to slot into place and they offered me the gig! I guess things were looking positive when, after literally playing the first song through once, they all came, shook my hand and said it was the best they've ever heard it sound!! "The singer Kim later told me that he didn't know whether to laugh at my playing, or be very scared. I took this as a compliment." Robin will now hook up with the 'Tailz for the following gigs (with more across Europe thought to be in the works), but he added that the shows won't affect his numerous other drumming commitments. For more head to www.tigertailz.co.uk.